AOBA members are dedicated to making a significant difference in our community. AOBA's community outreach programs are focused on supporting our region's youth. Association members, guided by hard-working volunteers on AOBA's Community Outreach Committee, volunteer each year to support Washington area schools and nonprofits. These organizations benefit from AOBA's generous contributors of volunteer hours, in-kind services and direct funding. This page highlights AOBA-selected charities. Scroll down to the bottom of this page to view a video focused on AOBA's Community Outreach initiatives. Covenant House Greater Washington as a new community partner. Covenant House Washington’s mission is “to empower, safeguard and serve youth experiencing homelessness, disconnection, and exploitation in the Greater Washington region.” The wrap-around supportive services provided by Covenant House to area youth include housing (both emergency housing and longer-term support); workforce readiness; job placement; a Child Development Center; and drop in services. This effective nonprofit is based in downtown DC but provides benefits to individuals across the region. "Whether your strength is home improvement, gardening, cooking, tutoring or helping to organize clothing and toiletry drives, there will be a place for you at Covenant House,” said Tony Curtis, Classic Concierge, who serves as Chair of AOBA’s Community Outreach Committee. For the first time in November of 2018, AOBA participated in Covenant House's "Sleep Out" event to raise awareness about homelessness. The Association's fundraising goal was $10,000, and generous members (and hardy volunteers who participated) exceeded the goal - raising more than $12,000 for Covenant House's homeless youth services. 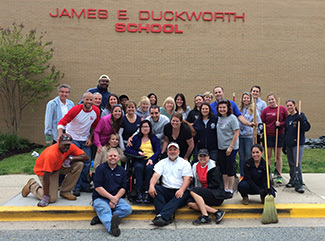 Each year, AOBA supports the James E. Duckworth School in Prince George's County, since this school for children with disabilities has ongoing needs that can not be met by the County's Board of Education. For example, the Association raised funds for a "Sensory Room" to assist the school's autistic children and in 2017, completed a major DIY project that involved totally renovating the Teacher's Lounge and Independent Living Apartment. In addition, each spring, AOBA staff and volunteers converge on the school to provide support at two events, Clean Up Day and Special Olympics Challenge Day. At Clean Up Day, volunteers work to clean and landscape the school's grounds and clean and enhance interior spaces. At Challenge Day, volunteers cheer on students as they participate in Special Olympics activities. 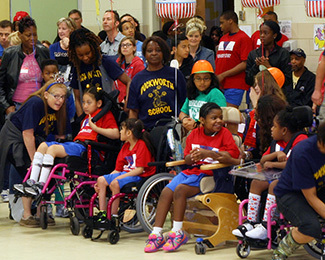 THANKS to all member firms who generously contribute to our annual programs at Duckworth! Also, AOBA and the Duckworth School launched an award in 2014 to honor the legacy of volunteer Charles Castle, Jr.
For details about this annual award, download the 2018 Call for Nominations. In conjunction with Prince George's County Community College, AOBA sponsors an annual Scholarship Program. Graduates of Prince George's County high schools may receive up to $6,000 in paid tuition to Prince George's Community College over a two-year period. at the 2018 Scholarship Reception at Prince George's Community College. Since the AOBA Scholarship Program was launched 22 years ago (in 1996), AOBA members have raised $950,800 which has been used to support the academic careers of 162 scholars at Prince George's Community College. 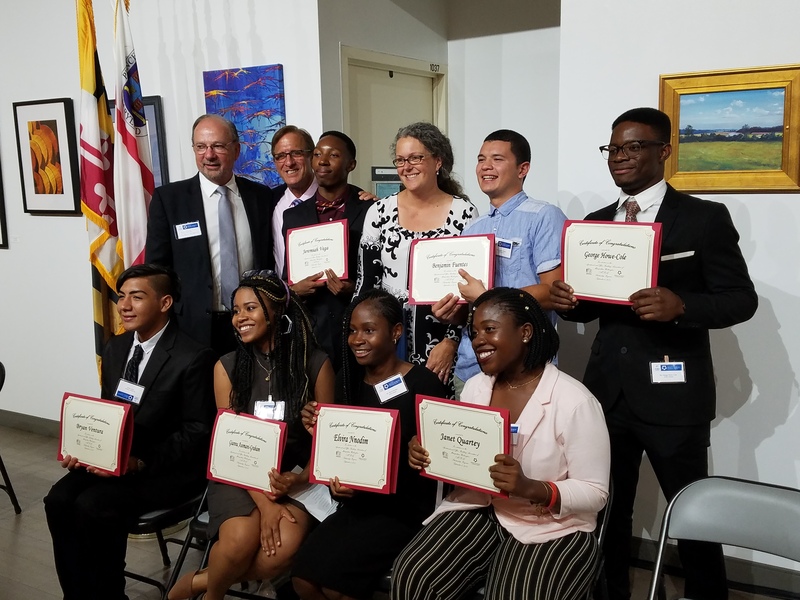 Most of these outstanding Prince George's County students have completed study at PGCC, and many are now employed by AOBA members. Take a moment to read a heart-felt testimonial by a Prince George's County Community College student who was awarded a scholarship. AOBA has recently partnered with an impressive non-profit organization, Shelters to Shutters, which engages property managers and real estate professionals to provide housing and job opportunities for individuals looking for a "hand up" not a "hand out" on their path from homelessness to economic self-sufficiency. Shelters to Shutters provides participating property management companies with pre-screened, job trained candidates for their entry level positions. They identify successful candidates through partnerships with local non-profit organizations serving the homeless, veterans, and domestic violence victims.